There’s a famous episode of Father Ted, where upon spotting actor Richard Wilson (aka Victor Meldrew), Father Dougal decides it would be a great idea to approach him and yell ‘I don’t believe it’ in his face. Cos, well, I bet no-one’s ever done that before. I have a similar urge every time I ever see the name of Bostik South Central Division side South Park. Just seeing or hearing the name brings memories of university nights spent watching the quirky American adult cartoon come flooding back. It just makes me want to yell, ‘Oh My God, they killed Kenny’. Explaining this to my wife prior to heading off on my latest groundhopping adventure to East Grinstead’s East Court Ground (or GAC Stadium) for an FA Cup Preliminary Round match between East Grinstead and the aforementioned South Park, inevitably leads to some awkward questions. “Who’s Kenny?” inquires the 5-year-old. “What’s South Park?” asks the 8-year-old. Deciding that they're slightly too young to enter the warped and rude world of South Park, I instead deftly sidestep the question by mumbling, “err… it’s… err… it’s just a thing.” Pretty sure that will explain everything perfectly. It’s just me and the youngest who are in attendance for this match. Arriving at the ground after a plain-sailing 45-minute drive down the A22, it’s great to discover there’s a car park located right outside the ground and, even better, there’s still spaces! Our first view of the ground is impressive. 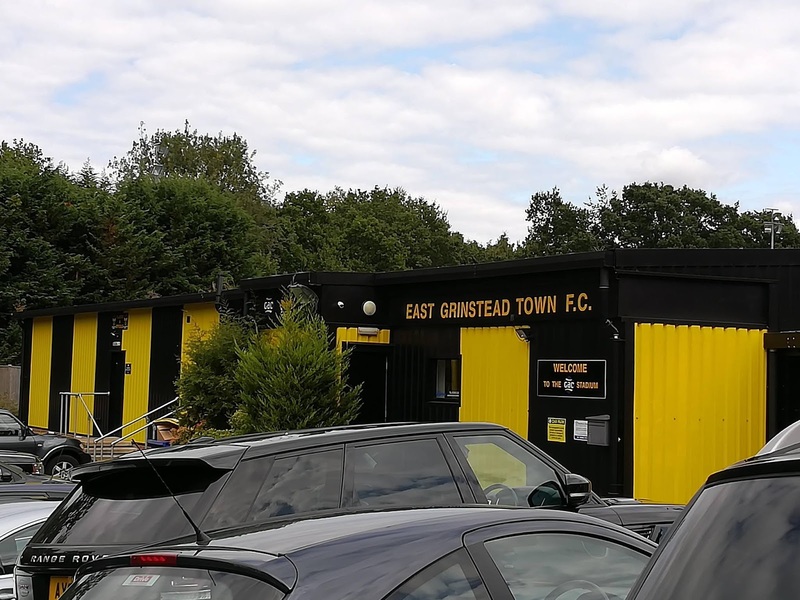 The black and yellow painted clubhouse building is immediately bright and striking as is the view of the mains stand that we can glimpse from the car park. I explain to my son that everything is black and yellow because East Grinstead are nicknamed the wasps. Unfortunately, he doesn’t quite grasp this relatively simple fact are persists in spending the afternoon referring to them as the ‘buzzy bees’. Which gets slightly annoying after the hundredth time of explaining to him that their called the wasp. And that’s before half-time. Anyway, we’re getting ahead of ourselves. The entrance fee for the game is £10, which is the most I’ve paid so far on my early days as a groundhopper. That said, the majority of the games I’ve attended have been at county league level and as The Wasps play in Bostik League Division One South East, the slightly higher price is not a great surprise. Once again, the boy is waved through free of charge (thumbs-up) and there is a decent matchday program (another thumbs-up). 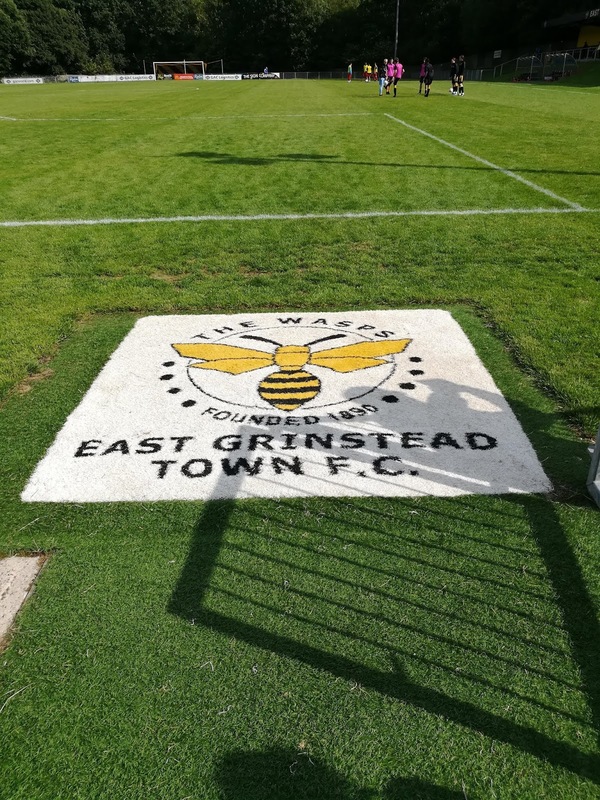 The program is actually something of a double-header, as it is the same one which will be used for the league visit of Whyteleafe on Bank Holiday Monday. I’ve not problem at all with this. It’s totally understandable that producing two completely different programs in three days is something of a logistical nightmare (not to mention extra expense). 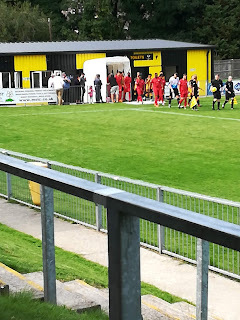 However, I was slightly disappointed with the price of £2, which again is the most expensive I’ve come across so far and, despite being a double-header’ featured less pages than the ones from the last three matches I’ve attended – Haywards Heath, Shoreham and Bootle. Yet it’s not a major gripe. I always like to buy a program when I can and today is no different. Once through the turnstiles, the ground itself looks great. Surrounded by trees on three sides with a sizable seated stand and smaller standing stand on the other, the pitch looks immaculate and, much to my young companions’ huge excitement there’s even a player’s tunnel! The first ground we’ve seen one at. Regular readers of this blog will know what a big deal this is to my youngest. The game itself begins quite cagily. This is probably not a huge surprise. Both teams are without a league win in the early stages of the season, and with the winners of today’s game not only progressing one step further on the road to Wembley, but also set to receive an extra £2,890 for the club’s coffers, the incentive for victory is further heightened. The main talking point of an evenly-contested first 45, occurs around the mid-way point of the half. As a South Park striker races through on goal following yet another missed header from the Grinstead defenders (there are plenty of these throughout the afternoon), goalkeeper Sheikh Ceesay clearly handles the ball outside the area preventing the ball from going over his head and towards the goal in the process. Despite being spotted by the ref and linesman, the keeper is surprisingly only shown a yellow card. Even the Grinners fans seemed surprised by this decision. It’s a decision that will prove to have devastating consequences for the visitors later in the game. The game’s only goal comes just after half-time. There’s no surprise that Wasps frontman Sid Sollis is heavily involved. Not for the first time in the afternoon the number nine raced away from the defenders only to see his shot saved by South Park custodian Michael Eacott. Unfortunately for him, the ball fell invitingly for the onrushing Ben Wilson who finished comfortably from close range. Cue mass celebrations and a huge bundle which ultimately led to the goalscorers’ hair band falling out (not sure what my late father would have made of me writing that sentence. The game’s changed). The goal buoys the home-side, and numerous chances for them to extend the lead come and go over the next 20 minutes. That the lead isn’t built upon owes much to Eacott who makes at least two superb saves to keep the hosts at bay. In the last 10 minutes or so, South Park give everything to find that equaliser. With just a couple of minutes or normal time remaining, an East Grinstead defender is deemed to pull back a South Park winger, and while it looks a soft decision from where I’m sitting, a penalty is awarded. Captain Matt Males steps up to take, but his well struck shot is at a good height for the goalie (cliché alert) and Ceesay makes a good save (see video). However, had the keeper been given his marching orders earlier in the game… well… who knows what would have happened, but you can be sure this late twist added more than a touch of annoyance to an already annoyed South Park bench and fans. 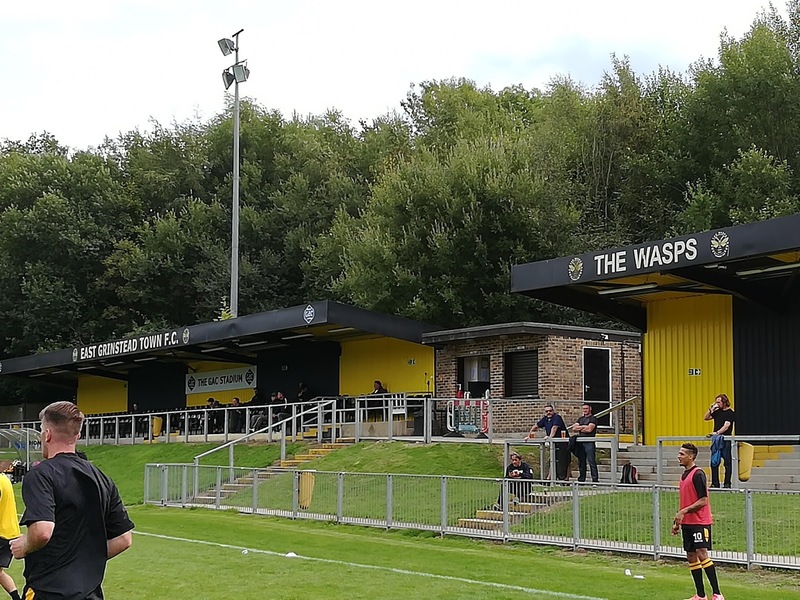 After an injury time which seems to last forever, the ref finally brings a halt to the game, and the Wasps progress to the next round by the narrowest of margins. Leaving the ground, and seeing a man in a South Park t-shirt, I get the urge to shout, ‘oh my God, the Wasps killed South Park’. But I don’t. Turns out I have rather more self-control than Father Dougal.